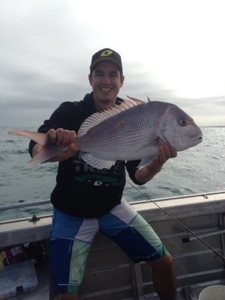 Snapper are a staple demersal species found in the southern parts of Australia. They are a great fighting fish and can grow to over 10kg. They are commonly targeted using bait, live bait, soft plastics, metal jigs as well as hard bodied lures. The key to catching this species is knowing when and where to find them. The fish hang around structure such as reef, but often are found crushing deep channels or bays for a feed. Snapper are known for their strong fight and the classic “head shakes”. The traditional snapper outfit was 10+kg rod spooled with some heavy mono. This is still an effective combo today, but there are lot more options. Snapper are hard fighters but don’t tend to be too dirty, meaning they will generally not pull you into the reef. So you can use pretty light tackle. They sometimes have sharp teeth and the larger specimens bite hard, so it’s always important to run a good quality leader. 40lbs is normally enough. Snapper seem to be most active in the early hours of the morning just after Dawn and the later hours of the day around Dusk and later. It’s a good idea to anchor up around an hour before these times and start putting out a regular trail of burley. A good idea is to chop up a few kilos of Pilchards and throw a few bits overboard every so often. This will bring the hunting fish in for a look. If you can see fish on your sounder but they don’t seem to be taking the bait, it could be that they are being extra cautious. I good idea is to use very light weights and keep the drag off the bait until the fish has had time to eat it. For this reason, bait runner reels are popular. If you don’t have bait runners, you can open up the spool of your regular spin reel and grab a few loops of line and hold it lightly with a rubber band. Just make sure you regularly check your lines as it’s easy yo get spooled by a big fish at night when you cant see the rod tips. Another good idea is to mix up the bait with a lure of some sort. The Shimano Lucanus jig works really well, especially when the fish are not feeding hard. You can simply drop one of these to the bottom, reel it up a few winds and leave the rod in the rod holder. You don’t need to strike as the fish usually hook themselves.